"I usually get up at 07.30hrs and aim to start working by 09.00hrs, if not before. (I like to use military vocabulary for time keeping!) When I’m working I always have a concoction of different cereals for breakfast. I tend to have two coffees with my boyfriend before he leaves for work, then I feed our tropical fish and get on with the day. I am a natural tomboy, so I always wear trousers or shorts. I make a lot of trousers, so these may be my own high-waisted creations or simply some skinny jeans. I’m lucky enough to have a workroom in my flat, so when I’m working on DIYcouture, I don’t need to leave the house at all. I also have a part-time job in a crafts workshop, making multi-sensory books for people with severe learning disabilities. This is at the opposite end of London from my house, and I get there on my trusty bicycle, usually wearing waterproof trousers and a raincoat! I recruit and co-ordinate skilled volunteers at my part-time job, a charity called Bag Books. The books we make are very unsual. Each page is an A3 piece of stiff board with a handmade object attached to it. The page may also have a sound or a smell. As well as supporting volunteers I also do a lot of hands-on making with fabric and wood as all of the books are created from scratch in the workshop. It’s a great job and I do it three days a week. I tend to work on DIYcouture for three days a week too and give myself one day off. I also tend to answer DIYcouture related emails in my lunch break and in the evenings. I go everywhere by bicycle in London as it allows me to feel a sense of control in the city. I enjoy negotiating my way from Hackney in the North East right down to Battersea in the South West, which is where the Bag Books workshop is. I get to cycle over the River Thames and feel the wonderful British weather on my face and sometimes in my shoes. I love it! My flat where I do DIYcouture is quite near the site of the 2012 Olympics, in a small area called Homerton. I live on a main road which is a strange mix of kebab shops, dry cleaners and trendy cafes! A fairly expensive vintage shop has even recently opened up there which is great for clothing research. My front door is sandwiched between a Nigerian jewellery shop and an Eastern European snooker club. There is a lot of floor space for sewing in our flat, basically because we live in a strange ramshackle building and cannot fit a sofa through our very narrow front door! 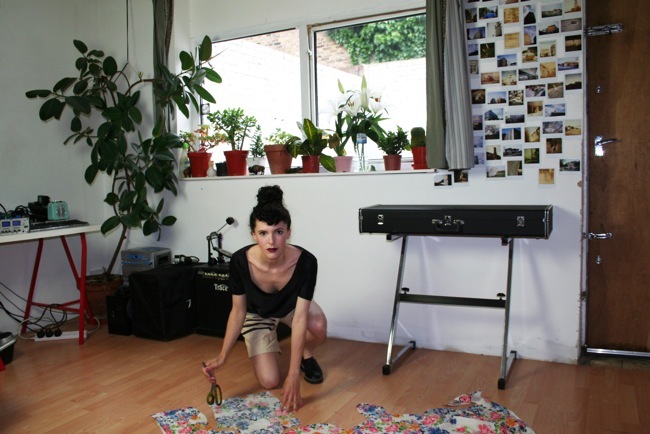 My boyfriend makes music so our flat is jammed full of my fabric and his various amps, keyboards, guitars and other pieces of equipment. My DIYcouture work is very varied, as I do almost everything for the business. I tend to deal with one big project at a time, so when I begin, I plan what tasks I need to do in order for this idea to become a reality, then I work through them methodically. I tend to give myself a deadline, which I write on my calendar, then I plan backwards from that date. At the moment I am working on releasing three e-books – ‘How to make a kaftan,’ ‘How to make a shrug’ and ‘How to make a tulip skirt’. I am at the design stage of the visual instructions themselves. I have spent a few months testing the garment construction process, taking photos of this, drawing diagrams using Adobe Illustrator, then finally organising and styling a photoshoot with different girls wearing the various incarnations of the garments. I am now at the point where I am gathering all this information together and doing page layouts in InDesign. I like to sit down and get on with this straight away in the morning, which is when I am most sharp. I also manage the DIYcouture website, and sometimes I dedicate full days to working on this. When I started DIYcouture in 2008 I couldn’t afford a web designer, so I bought a book for ten pounds and taught myself html. In the morning, my boyfriend may ask me what I am doing today, and I say, “Today I am going to change the internet”. I find web design very exciting, as I spend hours writing in code that looks like nonsense, then I upload the nonsense and it becomes clear imagery that anyone can access. I have been lucky enough to meet all sorts of great people through DIYcouture. When I first printed the books I started selling them at zine fairs in London, so I met a great crowd of DIY book artists, particularly Jimi Gherkin, an enthusiastic believer in getting stuck in and giving new things a go. He is part of a group called the Alternative Press who put on great zine-related events and I am proud to be part of many of them. I deal with all the people who stock my books, often inspirational women running their own haberdasheries or design shops, either physically or online, for example Barley Massey at Fabrications in Hackney, or Rachel and Michelle at Ray Stitch in Islington. I teach sewing workshops at sewing schools all across London, and have met some amazing, practical, ambitious girls through doing this too. 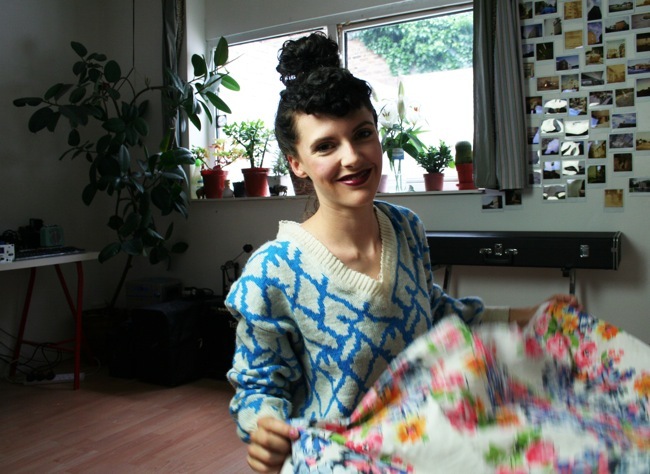 I am a huge admirer of Claire-Louise at The Thrifty Stitcher. She is a costume expert and is never afraid to explore new sewing gadgets or forms of digital technology. I also have the pleasure of working regularly with Louise and Claire (two people!) at The Papered Parlour in Clapham. They work incredibly hard to make their dream business a success. I deal with clothing and shoe designers, as I often borrow pieces to style the DIYcouture photo shoots. I try to borrow items from ethically-minded companies, or from independent designers. It has been a great pleasure to meet Amanda Luisa from I CAN Make Shoes and to borrow some great DIY creations from her. I usually have lunch around 13.30hr. Sometimes I am so busy at lunchtime that I just have marmite on toast, or chocolate spread on toast (I have a horribly sweet tooth!). Mostly though I make a big salad. My favourite is a kind of vegetarian salad nicoise, with leaves, raw broccoli, capers and soft boiled eggs. If I have sewing to do I will often do this in the afternoon. I find it harder to concentrate on the computer after lunch, so to avoid wasting time getting lost on Tumblr or some such like I tend to turn off the computer and get down to making. The hardest part of DIYcouture is admin – finances and record keeping. I have to force myself to do these, and when there are so many more pressing or exciting tasks to do these often slip down the list. I really have to strap myself down to tackle them. The other hard part is fitting everything in. I have so many ideas for DIYcouture that I would like to realise, but I must prioritise. Which leads to another hard part – making sure I don’t work constantly! I truly enjoy DIYcouture so much that I find it hard to give myself limits! 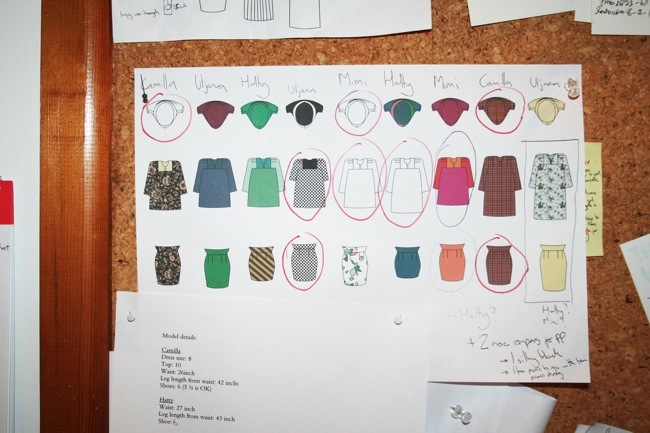 I find drawing the technical diagrams absorbing and satisfying, I obviously love to design and make clothes. I adore having an excuse to go fabric shopping and the way designing for other people (imagined users of the instructions! ), not just myself, allows me to explore fabrics I might not otherwise buy. I take great pleasure in breaking down a practical process and doing my very best to explain it so that others can understand. I still get nervous about teaching, but I love working with people who have never made a piece of clothing before and seeing how proud they are when they see that they have created something all by themselves. I started DIYcouture as I was frustrated that people I knew seemed to feel making clothes was not something within their grasp. I saw that beginners turned to patterns when they wanted to start sewing, but were often baffled by the complexity and therefore put off for life, or they saw old-fashioned images of people wearing unflattering clothing and didn’t feel inspired. I had a burning desire to make picture-based instructions that anyone could understand, in order to help more people access self-created clothing. I quit my full-time job doing research for a homelessness charity to pursue the DIYcouture project. My mum was quite worried about this and retrospectively it was certainly not very sensible, but I was 25, very determined and not especially sensible! DIYcouture has grown like things do, gradually and like a snow ball! I have learned so much through DIYcouture that I feel as though I have sort of put myself through art college. When I started I had never drawn a diagram before so I taught myself to use Illustrator. I couldn’t use InDesign, and my Dad spent many a painstaking hour with me at his shoulder doing layouts and showing me the ropes, so that using it is now second nature. My tip for other women planning to start a sewing business would be to allow your initial idea to adapt as time passes. You might begin with a very strong picture of what you want, but it may develop in a way you couldn’t imagine at the start. You will work out the best way for your idea to progress as you go. This brilliant post idea of Tilly’s is an investigation into making money from a sewing business. When I began DIYcouture I did have the idea that it would be a full-time business for me. As time passed I realised selling instructions alone did not make a business. I went through a period of considering all the ways DIYcouture could become a profit making enterprise. I played with the idea of selling starter sewing kits of scissors and thread but I didn’t want to buy a load of physical equipment that I would then feel tied to pushing in order to sell. I was approached by various companies who wanted to advertise on the DIYcouture website but I always turned them down. 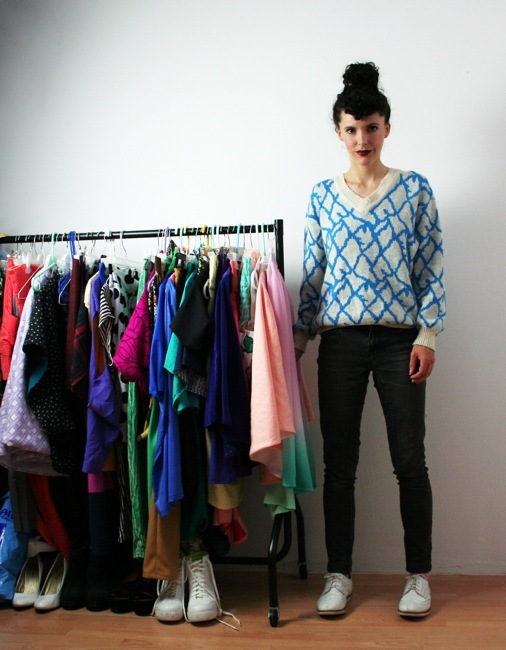 I wondered whether I was being silly, but realised that DIYcouture is my dream project. At that point I decided I would be happy to run it part-time, as a business that covers its own costs, rather than as a full-time job that I depend upon in order to make a full living. This way I avoid compromising the goals of DIYcouture and I maintain my passion for it, as one does with a hobby. Luckily, pieces of paid work have sprung from DIYcouture, such as the book I recently wrote and teaching workshops. My part-time job ensures that I can always pay my rent! In the first couple of years of doing DIYcouture I would work into the night, but these days I usually finish my day at about 18.30hrs or 19.00hrs. My boyfriend Joel has helped me to recognise the benefits of time-off! I play drums and practice with a band once a week. This is a lot of fun and very relaxing. I have a few friends in bands so we go to quite a few gigs to see them play. I like to read short stories and non-fiction books too. I don’t have a TV but my boyfriend and I own all seven series of Star Trek: The Next Generation on DVD and we have been steadily working our way through these over the last year! Before that we were watching the Leonard Nimoy series ‘In Search Of’ on YouTube. I love museums and galleries, so on my day off I often go exploring some of the amazing places that London has to offer. Dinner varies, it may be a pizza that my boyfriend and I enhance with extra vegetables, or we may get fancy and cook something from Ottolenghi’s vegetarian recipe book. If I am lucky, my sister will invite us over to dinner and we will have something exquisitely delicious that she has somehow found the time to rustle up (she runs her own jewellery business full-time)! She makes an amazing pecan and caramel cheesecake. I am usually in bed by around 23.30hrs, unless my band is playing a gig, in which case it will be horribly late and I will have to go to bed at 21.00hrs the next day!!" Oh Rosie! Can I be you, please? No? Is that just a bit creepy? Okay, I'll just admire from afar then!